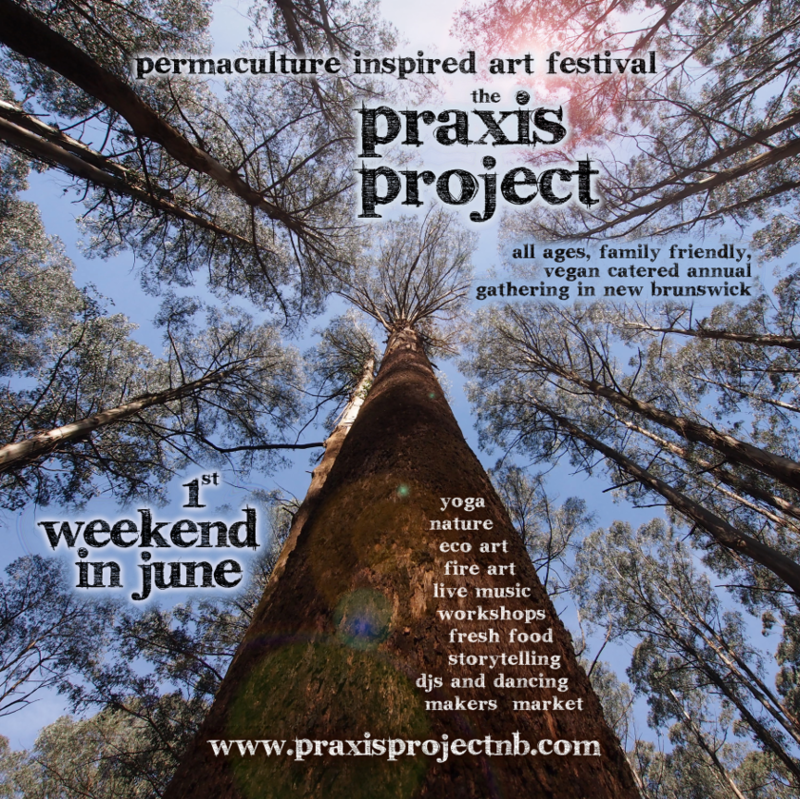 The Praxis Project Gathering is a catered 3-day permaculture-inspired arts festival. The intention of this family friendly gathering is to subsidize higher ecological learning in a fun environment. With the help of Earth University we are bringing together leading facilitators from across the globe. Bringing together gardeners, farmers, forestry experts, natural builders, homesteaders, botanists, alternative medicine practitioners, crafts persons and those who simply love nature for any reason at all. Our dynamic location is nestled in the Foothills of the Appalachian mountains is, apx 1.5 hours from Fredericton. Through your sponsorship/partnership, you will be contributing to the success of this event, to the creation of an intergenerational Food Forest, and to the growth and strengthening of a budding community of permaculture enthusiasts. Through sponsorship/partnership, you will be able to align your brand with a fun event and thriving community while getting a great opportunity to attract new customers/clients. Higher levels of sponsorship include Project passes. These passes are great opportunities to provide professional development for yourself or staff and promote your work in-person. Space in our vendor’s area also allows you to benefit financially through selling your product or promoting your service. See the next page for detailed information about Sponsorship Levels. ​Unable to Sponsor at this time? 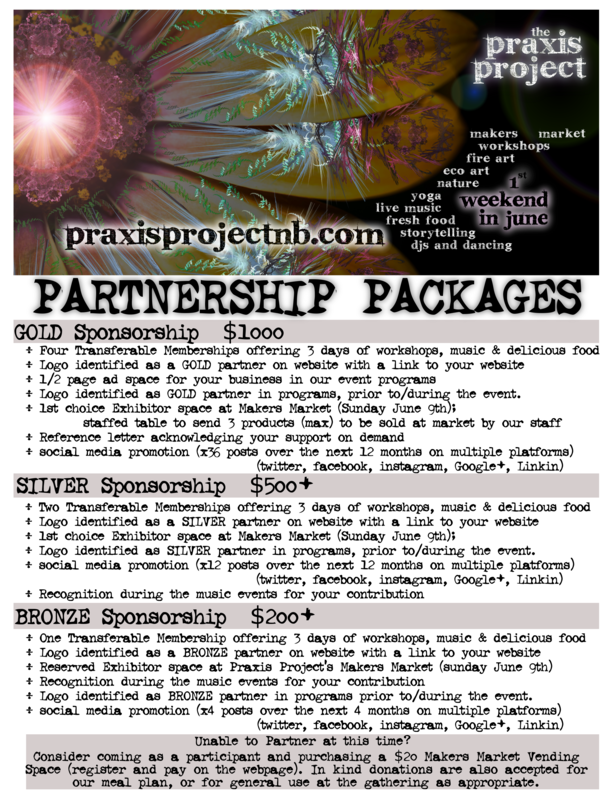 Consider coming as a participant of the Praxis Project AND purchasing a $20 Makers Market Vending Space. Please send an email here (to praxismakersmarket@gmail.com) and fill out this survey. In-kind donations are also accepted for our meal plan, or for general use at the gathering as appropriate. If you are interested in sponsoring or partnering with The Praxis Project, please send an email with your intention to sponsor/partner and we will respond. Feel free to contact us with any additional questions. Thank you for your time.